An Elephant grazes on the shores of the Nile River and momentarily stops to watch as we float by. Murchinson Falls National Park, Uganda. A man stands next to his motorized canoe as he waits on the shores of Lake Victoria seeking passengers in need of transport. Lulongo, Uganda. A boy gets up from a desk inside a marred primary school in Alanyi, Uganda. Students line up for the morning assembly outside St. Lawrence Primary School. Migeera, Uganda. A young boy and girl sit under a tree in Alanyi, Uganda. A woman sits up on her cot in St. Francis Health Center’s maternity room after giving birth only three hours prior. Migeera, Uganda. A boy is guided by nurses during his eye examine at St. Lawrence Primary School, Migeera, Uganda. 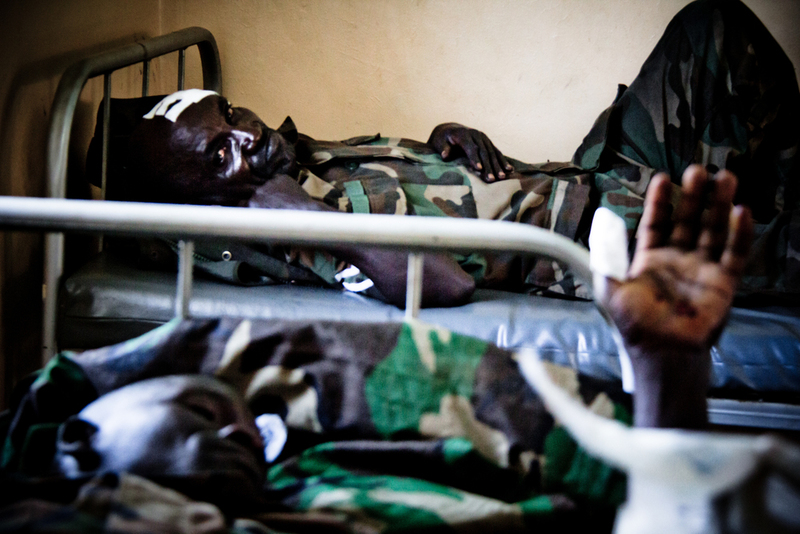 Injured Soldiers of the Uganda People’s Defense Force await follow-up treatment at St. Francis Health Center, Migeera, Uganda. 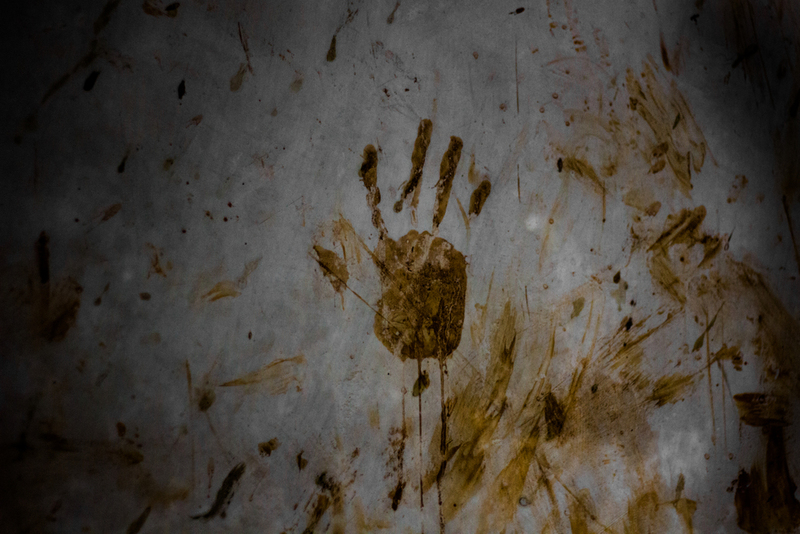 A handprint marks the wall of a holding cell inside the former torture chambers of Idi Amin and Milton Obote. Kampala, Uganda. 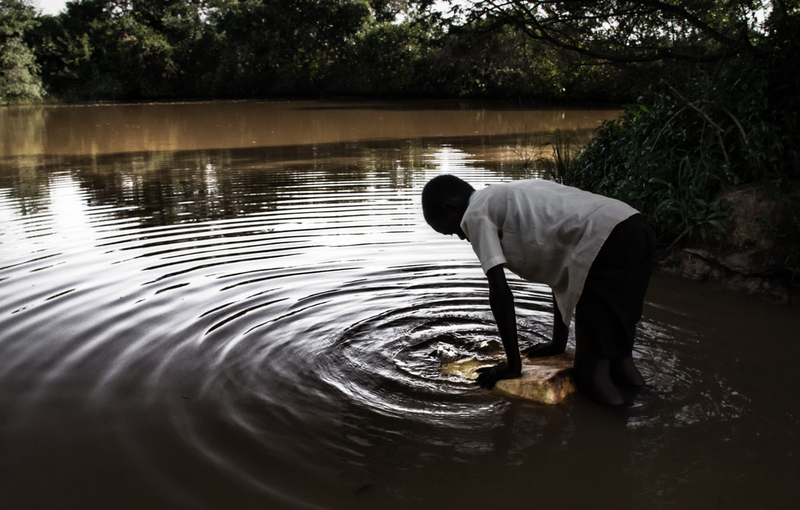 A Mother and her daughter collect water from a still-water dam located on the outskirts of Migeera, Uganda. A young boy poses near his family home in a rural village outside of Migeera, Uganda. St. Francis Health Center, Migeera, Uganda. An elder man sits and poses in Nabbingo, Uganda. A young girl watches from an abandoned house in a rural village outside Migeera, Uganda. A boy runs after a soccer ball in a pick-up game with classmates during a midsummer rainstorm. Migeera, Uganda. A man fills his jerry cans from a muddy pond outside Migeera, Uganda. The students of St. Lawrence School celebrate the opening of a newly installed water system to the township of Migeera, Uganda. A dead Marabou Stork on the shores of the Nsooba River in the Kalerwe Slum, outside of Kampala, Uganda. A young boy carries a jerry can from a clean water source in the slum of Kalerwe, outside of Kampala, Uganda.